While only a short hop from many European airports, Morocco introduces the real culture of Africa, a place of warm hospitality and the heady sights and smells of a very different land. Whether you are strolling the old streets of imperial cities, atop a camel in the Sahara, bathing in the beautiful coastal waters or walking in the majestic Atlas mountains, the land of muezzins and medinas will capture your heart. And so will the grand and impressive modern Morocco property you can find throughout this exciting country. Morocco sits on the northern coast of the African continent, encompassing an area of over 700,000 square kilometres. Once a protectorate of France, today the country is a constitutional monarchy led by the King of Morocco and both the people and the ruling elite are well-known for their support of democracy and openness to the Western world. Many of the larger cities such as Casablanca, Marrakesh, Tangier, Fes and Agadir exhibit beautiful Islamic architecture, influenced by the Portuguese, Spanish, French and African peoples that have played a part in their rich history. Almost all larger towns and tourist resorts have Morocco property for sale to suit your budget and expectations. Winding cream and ochre alleyways stretch out amongst the traditional houses, warm sunshine etching out the cool shadows of palm trees on the centuries-old pavements. The country enjoys a mainly Mediterranean climate, with the rich coastal plains forming the major agricultural region. With shifting dunes, rocky plateaux, beautiful gorges, verdant valleys and forests of cedar and cork oak, Morocco offers a varied terrain for hiking and nature trekking. Much of the country is mountainous with the Atlas and Rif mountain ranges drawing experienced climbers to view the wonderful panoramas. For those looking for fun rather than fitness, short camel trips can be arranged to enter the heart of Morocco and meet its diverse peoples. Another way to see the country is the air-conditioned ‘Oriental Desert Express’ which runs for 305km through the Sahara desert between Oujda and Bouarfa. Along the route there are fantastic vistas across the undulating sands, with several stops for photographs. Whatever your interests, you will find stunning Morocco property to suit your budget and lifestyle. Both Mediterranean and Atlantic coasts are rich with unspoilt beaches on which to laze away the days under a crystal blue sky. For the more active, many beaches have the latest water-sports on offer such as wake boarding, jet skiing and kite surfing. Between April and September, surfing and windsurfing is popular on the Atlantic beaches as the north east trade winds blow. The jewel in the crown in the south of the country is Dakhla, where the water is 25 degrees year-round and it is possible to enjoy ideal surfing conditions. The Mediterranean coast has warm, calm waters with smaller, more intimate bays and coves of fine white sand, where life is even more relaxed and traditional. Of course, there is Morocco property close to the many activities and amenities are on offer for those who seek them, such as golf courses, museums, marinas, fishing, coastal cruises and rich markets bursting with trinkets and other wares. Morocco is well-known for the quality and diversity of its souks, where bartering and haggling is a fun way to search out a bargain. Hand made exotic crockery, jewellery and woven fabrics are Moroccan specialities and can be found in almost every market, with beautiful regional variations in styles and colours. Another product for which Morocco is famous is its leather goods, with meticulous attention to detail paid and the highest quality materials used. 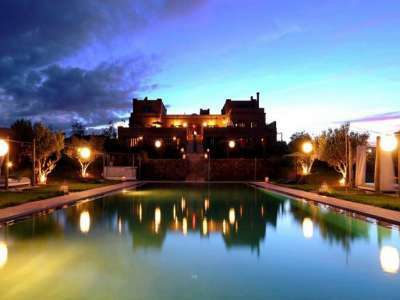 What better way to explore the diverse and spectacular sights of Morocco than by owning Morocco property. 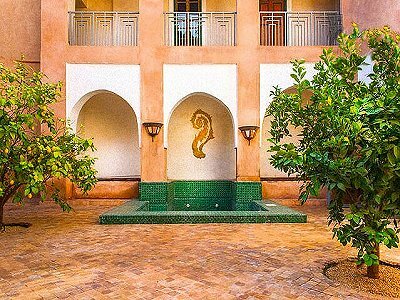 With its short-haul proximity to much of Europe offered by major low-cost airlines, Morocco, with its Mediterranean feel, represents an original and safe choice for property buyers looking for better value for money. Allied with a much lower cost of living and similarly low property prices, the Morocco property market is emerging as a place to retire or buy a holiday home. For those looking to buy Morocco property as an investment, there is no tax on rental income to pay for 5 years after purchase and capital gains tax remains fair, with 20% on profits over £60,000 with a reduction after 5 years to 10% and 0% after 10 years. Furthermore, those who would like to retire to Morocco will be pleased that the country has zero inheritance tax for property left to family. The country enjoys low inflation and a stable economy, with average return yields of up to 14% on Morocco property. With property prices in southern European countries remaining strong, Morocco property represents a unique opportunity to buy an affordable traditional or modern residence to enjoy the splendours of a cultured and beautiful country. Historic Riad Hotel for Sale in Marrakech, Morocco, close to the Royal Palace, with 7 Bedrooms.